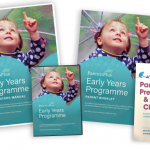 Parents Plus Early Years Programme – Parents Plus! Drawing on well-researched ideas about child development, and parent-child communication, the Parents Plus Early Years Programme is ideal for parents who want to maximise their children’s learning, language and social development, as well as reduce behaviour problems, while ensuring their children grow up happy and emotionally secure. The programme is suitable both for children within the normal range of development as well as children with special needs, such as ADHD, speech and language and other developmental difficulties. Two DVDs which contain three hours of footage containing over 80 real scenes of parenting situations, which are backed up by comments from professionals, parents and children. A comprehensive Facilitator’s Manual which contains the full text of the DVDs, extensive background information, a full guide on how to prepare and run each session of the course, detailed group exercises, handouts and home work assignments. Two parent booklets which contain all the handouts and worksheets for participants. The package also comes with an accompanying parents’ book ‘Parenting Preschoolers and Young Children’ (Authors: John Sharry, Grainne Hampson, and Mary Fanning). The Parents Plus Early Years Programme is evidence-based and several studies attest to its effectiveness in clinical, preventative and community settings. To run the Parents Plus Early Years Programme you need to attend the three-day facilitator training. This will take you step-by-step through the ideas and principles of the programme and will show you how to deliver the programme in clinical and community settings. Participants will be shown how to use strengths-based video feedback within individual parent-child sessions as well as how to facilitate solution-focused parent groups. Parents Plus also provides post-training supervision as part of an established Accreditation Process. 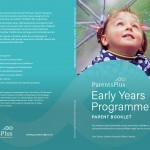 For information on upcoming training for the Parents Plus Early Years Programme click here. 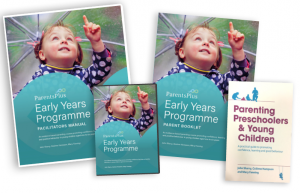 In November 2016, the Parents Plus Early Years Programme (PPEY) was updated and fourth editions of the Facilitator Manual and Parent Booklet were published. In addition, the original community six-week version of the PPEY will no longer be published separately. If you are using an older edition of the full PPEY Facilitator Manual with the fourth edition of the Parent Booklet, please note the changes outlined in the document here. If you are using the original community six-week version of the PPEY Facilitators Manual/booklet with the fourth edition of the Parent Booklet, please note the changes outlined in the document here.